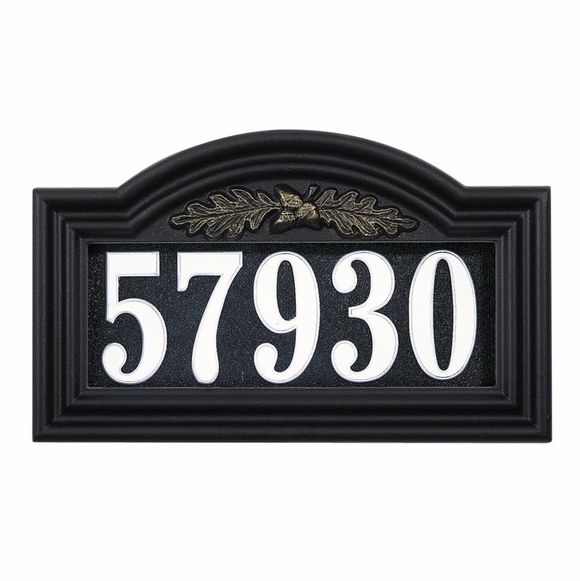 Personalized Oakleaf Arch Illuminated House Number Sign - - provides excellent visibility day or night. Wall mount or lawn mount. Made in USA. 13.5" x 8.5" arch plaque holds up to five 3.25" numbers. White vinyl numbers for 24-hour visibility. Internal light sensor automatically turns on illumination at dusk and off at dawn. Eight D-cell batteries (not included) provide 5 months of continuous nighttime illumination. Includes 15" lawn stake for street-side placement. Dimensions: 13.5"W x 8.5"H x 2.5"D.
Colors: VP verdigris; PS pewter silver; FB french bronze; BK black; BG black & gold (shown above). Personalized battery-powered illuminated address marker for wall or lawn. Helps emergency vehicles quickly identify your home.